Icelandic band Seabear are preparing for their first North American headlining tour. The band will perform songs from their upcoming record, We Built A Fire. They will be joined Via Tania and Seabear multi-instrumentalist Sóley. Sóley plays solo with occasional back-up by other Seabear members. Her Theater Island EP is set for release in March. 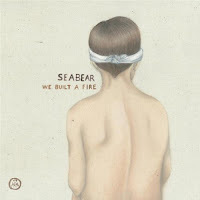 Seabear's We Built A Fire is scheduled for release on March 5. The exclusive iTunes pre-release will have six bonus tracks from the While The Fire Dies EP ... out a full month before We Built a Fire's official March 5th release. New York, you can catch Seabear for two shows. They'll be at Mercury Lounge on March 25 on the LES and at Brooklyn's Southpaw on March 26.